birth rate in europe on the rise? My mother, took a huge step of faith and went to Africa on a medical mission trip recently and on her way through Amsterdam she picked up a copy of the USA Today and saved it for me because of an article on the front page entitled Euro-babies go from bust to boom. It immediately caught my because of the graph you see below. Czech is on top! I don’t know what an 8.5% increase brings the rate to; it’s probably still low, but let’s be optimistic here! I was actually really excited to see this because the birth rates in Europe have been very scary in the last twenty years or so. The interesting thing in the article is that the main reason they site for this being alarming is that there are an extreme amount of Europeans nearing retirement and they don’t know how their pensions will be taken care of. Now this is important don’t get me wrong, but it is playing second fiddle to the bigger problem – the demise of European Culture. That sounds strong doesn’t it? It should. The birth rate for Europeans is so alarmingly low and the birth rates for Islamic immigrants is so high that the demise of the European culture seems as if it could be eminent. If you ever wanted to see Paris or Rome before you die, but haven’t had a chance to do so, you might want to hurry. Soon enough, most of what we now think of as Western Europe will be transformed into a branch of the Muslim world, which is sure to make it an even less welcoming place for Americans, Israelis and for Jews. Now that might be a bit strong as well, but it is a reality unless we continue to see birth rates increase amongst Europeans. Enter the Church. I really believe the local church needs to be revitalized in Europe to see the birth rates increase. Governments can try to offer as much incentives as possible, but let’s face it, having kids isn’t a priority to the average European. Heck marriage isn’t a priority for most younger Europeans. Why would it be? Thus the Church living missionally and living out a strong lifestyle of marriage and kids being on the heart of God and a blessing from Him is of the utmost of importance. I pray to the Lord that when the time comes for me to plant a church, get married and have kids (not necessarily in that order, well, kind of) over in Europe that my wife and I will take the lead and show the Czechs and Europeans we live amongst how great the Creation Mandate is! Just wondering how much the increased birth rates in Euro are from the rapidly multiplying muslims that are now living there. Not trying to be a black cloud, but those numbers could include a whole bunch of baby Mohamads and Fatimas…I picked up the book you recommended (while Europe slept) but haven’t read any of it yet. It was good to meet you. From the looks of the studies, these increased rates are Europeans and not immigrants. 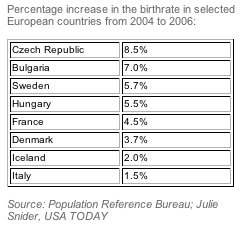 I could be wrong, but the Muslim population in Czech isn’t big enough to spike the rates 8.5%. But you are so right that the studies could be very subjective. Thanks for stopping by the site and it was great to meet you too!